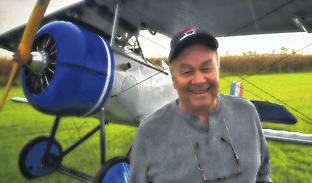 Provided photo Dan Patterson will speak at the WACO Aviation Lecture Series at 7 p.m. Thursday, April 25. Patterson will share a brief history of the Lafayette Escadrille, a 20-minute segment of the upcoming documentary film, and information about the current film project. TROY — Dan Patterson, a renowned aviation photographer, author, designer, lecturer, and now film maker, will speak at the WACO Aviation Lecture Series. On Thursday, April 25 at 7 p.m., Patterson will share a brief history of the Lafayette Escadrille, a 20-minute segment of the upcoming documentary film, and information about the current film project. Doors open to the public at 6:30 pm. Before the United States had even entered into World War I, 38 Americans volunteered to fly in order to aid our oldest ally, France. Their bravery helped spur this reluctant nation to join with France as an ally. The upcoming documentary is to tell of this squadron known as the Lafayette Escadrille. The film allows the viewer to experience the flying of World War I like never before, including the chaos of the dogfights and combat aerobatics. Patterson, of Dayton, has authored more than 40 books on aviation and was honored in 2003 as the National Aviation Hall of Fame’s first winner of the Harry B. Combs Award for Excellence in the Preservation of Aviation History. He has been a lecturer for the Smithsonian Journeys Program. Dan is currently the Artist in Residence for the Dayton Aviation Heritage National Historical Park. All aviation lectures are free and open to the public, and are held in the Willis Wing of the WACO Air Museum, 1865 S. County Road 25-A, Troy. Programs are scheduled to last one hour with questions to follow. Donations to the WACO Air Museum are accepted. For questions, call 335-9226 or visit www.wacoairmuseum.org. https://www.dailycall.com/wp-content/uploads/sites/30/2019/03/web1_WACO.jpgProvided photo Dan Patterson will speak at the WACO Aviation Lecture Series at 7 p.m. Thursday, April 25. Patterson will share a brief history of the Lafayette Escadrille, a 20-minute segment of the upcoming documentary film, and information about the current film project.